For example, his limbs might become giant magnets, enabling him to walk up walls or rip away enemy shields… Or maybe extendible spring-loaded hands would allow him to activate far-away switches or work as a grappling hook… Or he could have a tank-like body, easily crossing over spikes and pushing objects around the levels… These are just a few possibilities we’re considering (the game is still in the design phase), but you get the idea! 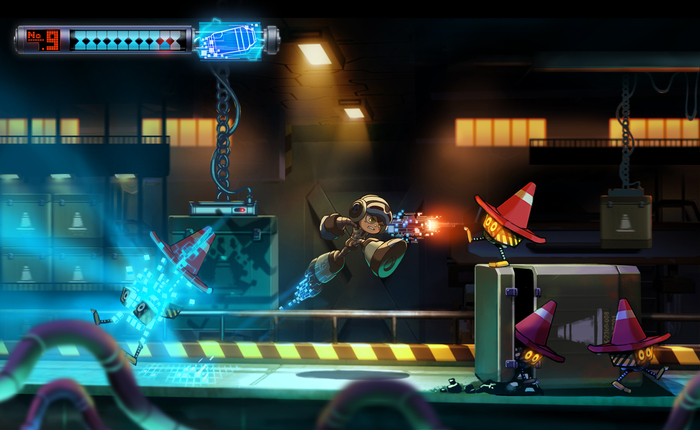 Inafune and co. are looking to raise $900,000 to make the game, which is tentatively scheduled for a PC/Steam release in Spring 2015. Stretch goals include two additional levels ($1.2 mil), Mac & Linux versions ($1.35 mil), a making of documentary ($2 mil), and PS3/360/WiiU versions ($2.5 mil). No mention of a potential PS4/Xbox One unfortunately. However, some of those stretch goals will most likely not be a challenge given the team behind the game, as well as some fairly cool backer rewards that are more than likely causing some old-school Mega Man fans to go into debt. The Mighty No. 9 Kickstarter campaign started started about an hour ago and has nearly hit the $100,000 mark. Check back with them between now and October 1st to see how much they get.